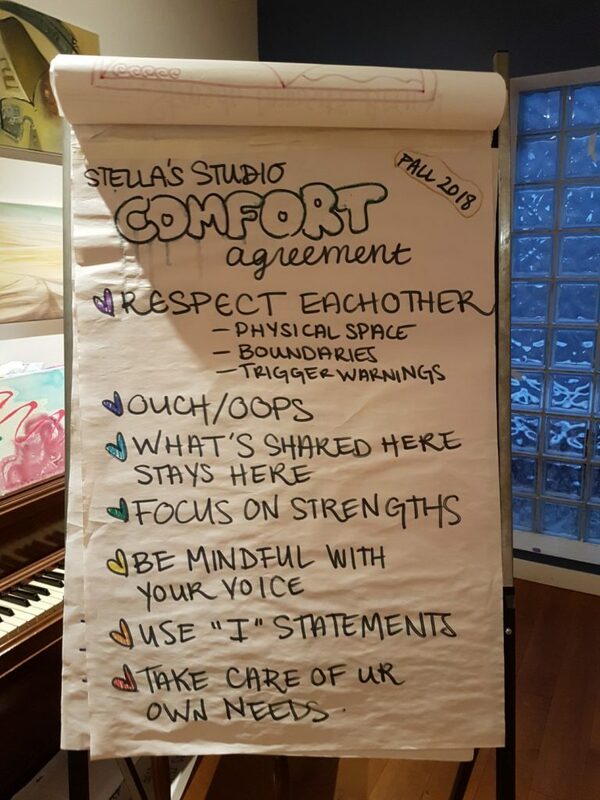 Stella’s Studio, our longest-running service provision program, continues to grow. Getting ready for another Studio evening! Responsiveness was a key value for the Studio in 2018. Studio has been filling up and late in the year, we had to implement a token system to prevent participants from sneaking in! 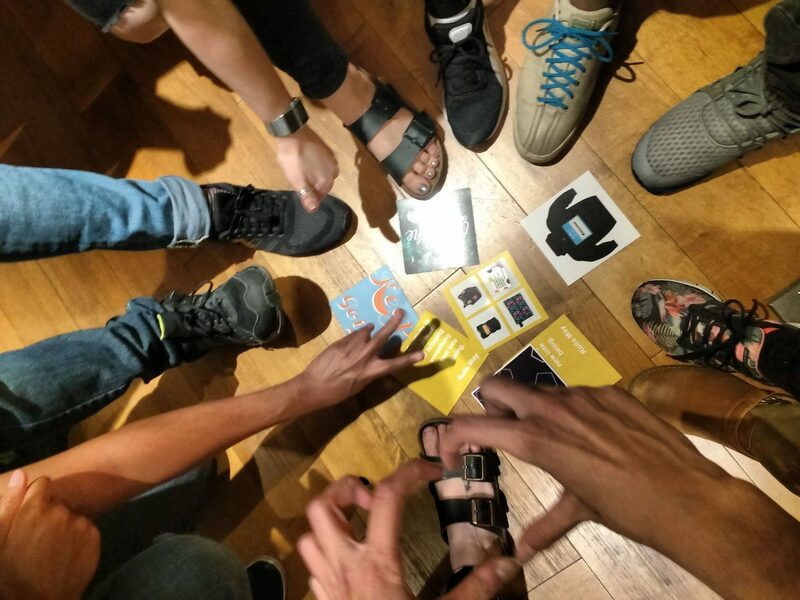 The new token system has been well received by participants. To further support the overwhelming demand for Studio, the Access team has been piloting extended Café hours and brought in a volunteer – Alyceia – to be a presence in the space. Thank you to the Access Team and Alyceia! The extended Café pilot has enabled Studio participants to swap out spots with folks who choose to leave early, which may explain why Studio attendance in 2018 averages at 12.8, more than our cap of 12 participants! 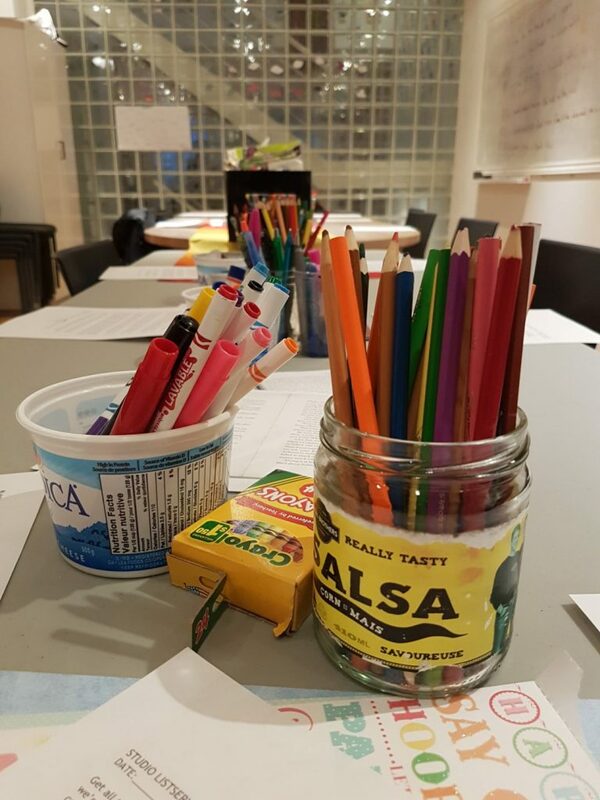 In addition, we responded to demand for space, time, & supplies for independent art projects with a more relaxed drop in version of studio- Art in the Café. Launched this past August, Art in the Café now runs every Monday from 3-5pm and it’s become quite the community! Despite intentionally limited advertisement, our Café tables fill up each and every week and participants enjoy connecting with one another as they paint, write, and draw with peer facilitators Funmi and Liz. 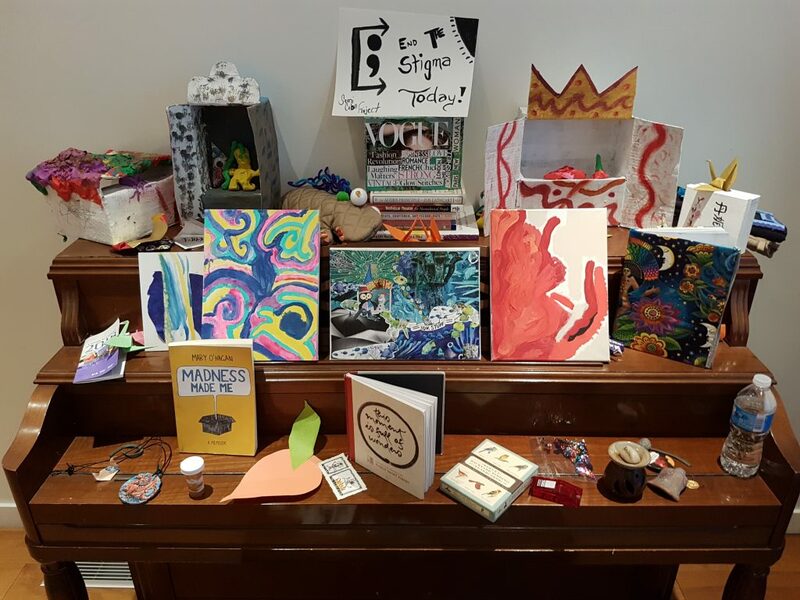 Stella’s Place’s arts-based engagement often serves as a front door for new participants because it’s accessible and low-barrier. We’re thrilled to welcome new participants each and every week at Art in the Café and Studio; it’s a privilege to watch them become part of our community. Collaborating with both our participants and the Access team has been such a joy for facilitators Funmi and Liz. If you believe in arts-based outreach, consider making an offer to support Stella’s Studio! We warmly welcome donations of the following: small to medium sized canvases, graphite pencils, acrylic paints, markers, stickers, loose glitter, glue sticks, clear glue, sketch paper, empty paper towel and toilet paper rolls, yarn and wool, magazines, and gently used plain t-shirts. 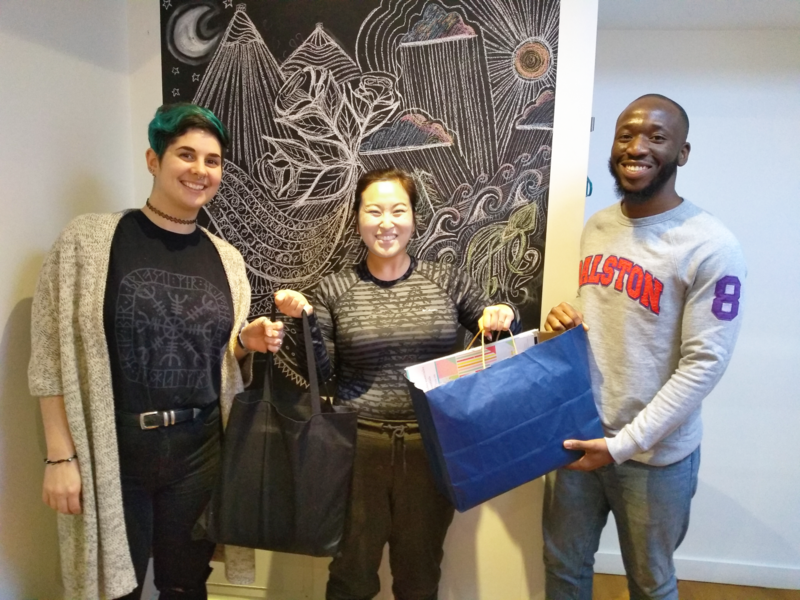 Studio donor Amanda of CreateBeing, shown here offering supplies to facilitators Funmi and Liz. Thanks Amanda and David! Facilitating a Studio Meet Up, see below. Thanks Amanda! Here’s to new creative adventures in 2019! 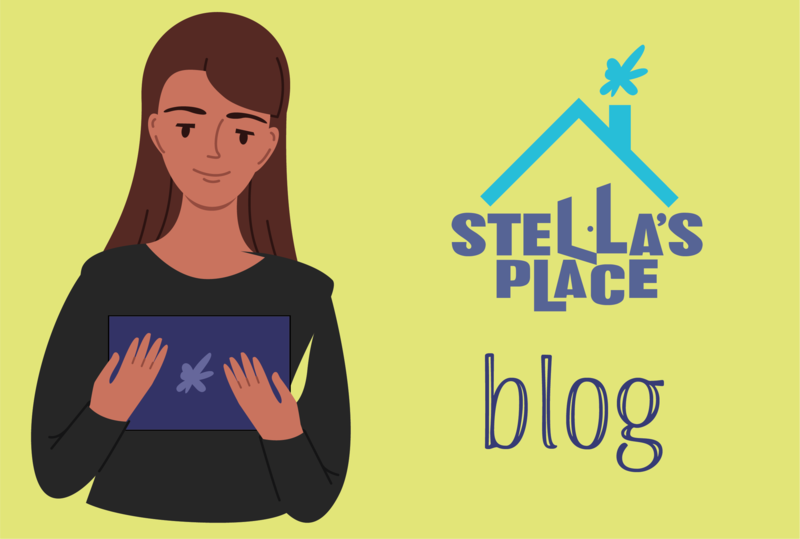 To learn more about the wide range of programs that Stella’s Place offers, please visit Our Programs page.